Foster carers are caring and compassionate people who are a valued part of The Lost Dogs’ Home community. By opening their homes and their hearts, these carers are providing a special service for dogs and cats who might need some time away from the shelter environment. 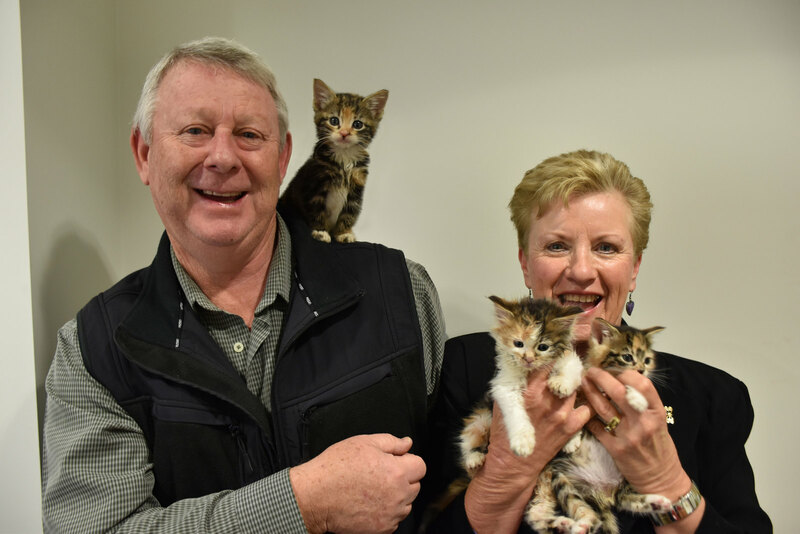 Foster carers Ian and Janis understand the effect opening their home and their hearts can have for cats and kittens needing to spend some time in foster care. They provide foster care to kittens who are too young to be adopted, recovering from a medical procedure, or who need to undergo some much needed socialisation in preparation for adoption. “For years I had been looking for some volunteer work related to handling animals. Since I love animals, I feel that this is the best way to give back to the community. “Since we started foster caring for The Lost Dogs’ Home in December with six three year-old kittens; since then we have fostered 14 kittens. We can name all of them too, since we chose their names based on their personalities, looks or a significant event,” said Janis. For Ian and Janis, their first group of foster kittens was their most memorable foster experience to date, especially when it came to playtime. “It was great to see each kitten grow and become more confident individuals, each with their own personality; we have had many laughs watching these little guys play,” Ian explains. Ian and Janis believe that there are many advantages of being a foster carer, including being able to care for the animals in the comfort of their own home. “Having the kittens in our home means we have visitors coming around more often; we also get a wonderful welcome home every time we go out. “The support of the Home and its staff has been a delight. On our first visit we were provided with everything we needed to foster these kittens; which is great as you do need a fair bit of time to play with them, sit with them and clean up after them. “Overall the experience is very rewarding. It is hard to say goodbye to the kittens when they are ready for adoption, but over time it does become easier,” said Janis. Being a foster carer allows you to become part of the wider community of staff, volunteers and foster carers at the Home, another positive for Ian and Janis.